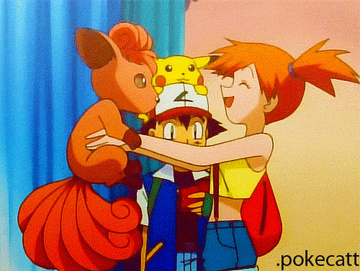 Misty (Japanese: ã‚«ã‚¹ãƒŸ Kasumi) was Ashâ€™s first travelling friend through Kanto, the Orange Islands and Johto. Misty loves water PokÃ©mon, hates bug PokÃ©mon, and is currently the Cerulean City gym leader. She was the first female protagonist on the show. Her dream is to be the world's greatest Water PokÃ©mon Master. Tags: Pokemon, Jessie, Ash Ketchum, Delia Ketchum, Misty, May, Dawn, Cynthia, Brock, Clair, Pikachu, Bonnie, Zoey, Ash Ketchum, Nurse Joy, Serena, Hilda "White"
Tags: Pokemon, Mira, Cheryl, Cynthia, Shauna, Elesa, Misty, Erika, Skyla, Jessie, Zinnia, Hilda "White"
Tags: Pokemon, Serena, Rosa, Misty, Gardevoir, Jessie, Dawn, Erika, Shauna, Ignitus, Leaf, Hilda "White"
Tags: Pokemon, Dawn, May, Misty, Jessie, Hilda "White"
Tags: Pokemon, Rosa, Serena, Misty, Cynthia, Johanna, Dawn, May, Elesa, Sabrina, Hilda "White"
Tags: Pokemon, Professor Juniper, Ash Ketchum, Delia Ketchum, Officer Jenny, Max, Jessie, Dawn, Misty, Iris, Cynthia, Pikachu, Hilda "White"